Many youth are thirsty for seeking knowledge, but they face many, many obstacles that arise from their localities – either because there are no scholars from the locality or the country they live in is a barrier between them and seeking knowledge; or the country that is to accept [or welcome their applications, requests for seeking knowledge] has conditions that [make it possible for] a few to be accepted and prevents many from entering into the domain of [seeking] knowledge. 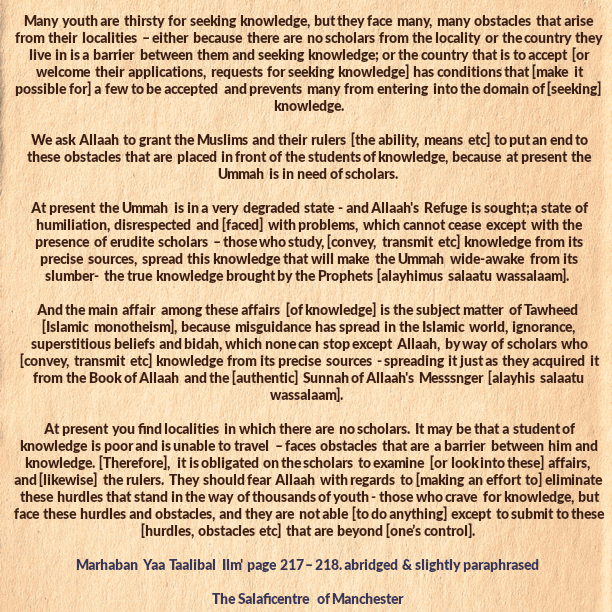 We ask Allaah to grant the Muslims and their rulers [the ability, means etc] to put an end to these obstacles that are placed in front of the students of knowledge, because at present the Ummah is in need of scholars. 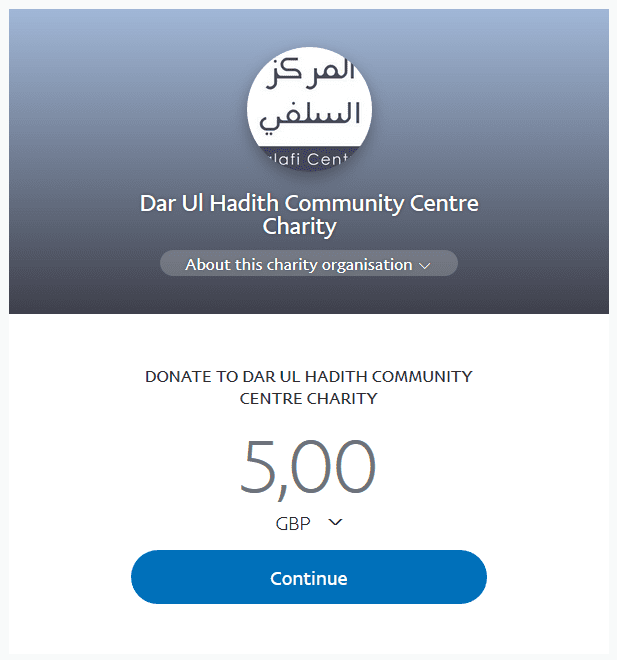 At present the Ummah is in a very degraded state – and Allaah’s Refuge is sought; a state of humiliation, disrespected and [faced] with problems, which cannot cease except with the presence of erudite scholars – those who study, [convey, transmit etc] knowledge from its precise sources, spread this knowledge that will make the Ummah wide-awake from its slumber- the true knowledge brought by the Prophets [alayhimus salaatu wassalaam]. And the main affair among these affairs [of knowledge] is the subject matter of Tawheed [Islamic monotheism], because misguidance has spread in the Islamic world, ignorance, superstitious beliefs and bidah, which none can stop except Allaah, by way of scholars who [convey, transmit etc] knowledge from its precise sources – spreading it just as they acquired it from the Book of Allaah and the [authentic] Sunnah of Allaah’s Messsnger [alayhis salaatu wassalaam]. At present you find localities in which there are no scholars. It may be that a student of knowledge is poor and is unable to travel – faces obstacles that are a barrier between him and knowledge. [Therefore], it is obligated on the scholars to examine [or look into these] affairs, and [likewise] the rulers. They should fear Allaah with regards to [making an effort to] eliminate these hurdles that stand in the way of thousands of youth – those who crave for knowledge, but face these hurdles and obstacles, and they are not able [to do anything] except to submit to these [hurdles, obstacles etc] that are beyond [one’s control].